♥Works BETTER than the OEM battery but for way less $$$!!! 【CAPACITY】6000mAh | Voltage:18V | 108Wh | Battery Type:lithium ion. The Ryobi one+ battery with a higher quality helps you do a good job! 【QUALIFIED】Products are CE, FCC and ROHS certified, tested by manufacturer to match or exceed specifications of OEM products. A qualified battery can be a strong backup for your Ryobi tools and help improve your working efficiency. 【SECURITY】Built-in Protection against overcharging, over discharge, over current, provides short circuit protection and steady voltage circuit. Reliable Ryobi battery ensures your safety, work flawlessly. 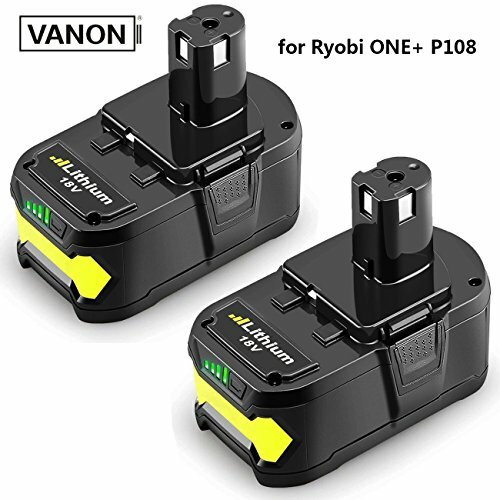 【GUARANTEE】All VANON products come with a 30-day money back and a 12-month limited seller's guarantee against manufacturer defects from date of purchase, and 24 hours' friendly customer service!